IndyStar.com – Remember when the Pacers played for the title? June 15, 2010 – Ten years ago, the Indiana Pacers had a chance to become NBA champions. Always groomsmen but never the groom in their NBA history, the Pacers finally reached the Finals after beating their nemesis — the New York Knicks — in the Eastern Conference finals. The Pacers fell in six games. They won two of the three games at Conseco Fieldhouse but had no answer for Finals MVP Shaquille O’Neal , who averaged 38.0 points and 16.7 rebounds in the series. The Pacers credited their rise to coach Larry Bird, who told them when he took the job in 1997 they had three years to reach the Finals. Bird, now the Pacers president, wasn’t big on small talk. He kept things straight and to the point. He had his players’ trust because he had been through the playoff battles as a player, winning three titles in his Hall of Fame career with the Boston Celtics. The Pacers adopted Bird’s whole-team approach. They surrounded All-Star Reggie Miller with outstanding role players. 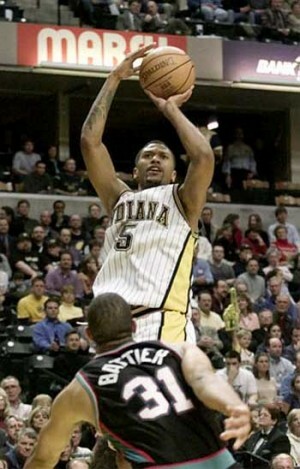 There was the steady point guard play of Mark Jackson, Dale Davis and Rik Smits in the frontcourt and a solid bench led by Perkins and Austin Croshere. Only eight players started a game that season, and the substitution patterns were set. Travis Best knew when he would go in for Jackson. The same went for Croshere and Perkins. It was Miller’s team, but Rose was the key. He led the team in scoring at 18.2 points to Miller’s 18.1.